The police released surveillance photos of the suspect wanted in the Columbus Park slashing on Saturday evening entering the Chambers Street subway station after the incident. The individual is described as a male Black, approximately 5'8" tall, 180lbs, bald and last seen wearing a gray tank-top. The New York City Police Department is asking the public's assistance identifying the individual depicted in the surveillance photos wanted for questioning in regards to an assault that occurred within the confines of the 5th Precinct. It was reported to the police that on Saturday, August 27, 2016 at approximately 10:40pm, 36-year-old male victim was sitting on the park bench at Columbus Park located on Baxter Street and Hogan place, in Chinatown. An unidentified individual approached the victim and slashed him with a box cutter causing a laceration to his left arm. The victim was taken to New York Presbyterian Hospital in stable condition. 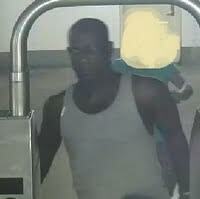 Surveillance photos of the individual entering the Chambers Street subway station after the incident. The suspect is described as a male Black, approximately 5'8" tall, 180lbs, bald and last seen wearing a gray tank-top.